He was speaking at a conference for forest scientists, and commented on accelerating rates of deforestation in south-east Asia and Africa. 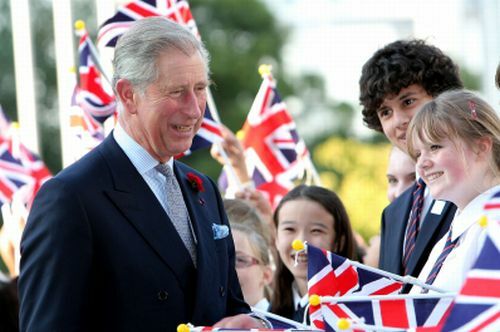 It’s great to see Charles speaking out on this issue and standing up to corporate lobbyists and others who appear unconcerned about the future of the planet. However, if forests are a key concern, he should be promoting a plant-based diet. We will not overcome climate change without massive reforestation, and the only way to do that is to claim back land currently used for grazing and animal feedcrops. The inherent and gross inefficiency of animals as a food source is the key prohibiting factor in that regard, causing us to use far more land than would otherwise be required to satisfy humanity’s nutritional requirements. Directly and indirectly, through grazing and through feedcrop production, the livestock sector occupies about 30 percent ice-free terrestrial surface of the planet.
. . . a global food transition to less meat, or even a complete switch to plant-based protein food [was found] to have a dramatic effect on land use. Up to 2,700 Mha of pasture and 100 Mha of cropland could be abandoned, resulting in a large carbon uptake from regrowing vegetation. Additionally, methane and nitrous oxide emissions would be reduced substantially. Zero Carbon Britain 2030 will revolutionise our landscape and diets. An 80% reduction in meat and dairy production will free up land to grow our own food and fuel whilst also sequestering carbon from the atmosphere. The report also represents an opportunity to tackle the relationship between diet and health in the UK by promoting healthier diets and lifestyles. The following image  shows that 58% of the planet’s appropriated plant growth in the year under review (2000) was fed to livestock, and provided only 17% of humanity’s calorie (energy) intake. 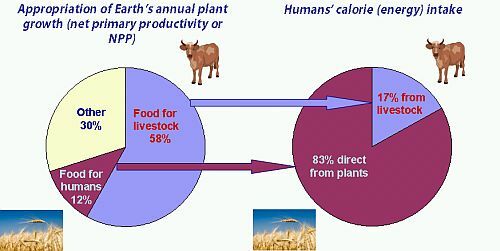 On the other hand, only 12% of the plant growth was fed directly to humans, and provided 83% of our calorie intake. For protein, the comparison was around 40% from animals and 60% from plants. If the comparison was based on a business whose end product was human nutrition, any competent management team reviewing the operations would throw out the animal-based approach. A general move away from animals as a food source is essential if we are to have any chance of preventing further catastrophic impacts of climate change. Do we want a habitable planet or don’t we? It’s our choice. Steinfeld, H. et al. 2006, “Livestock’s Long Shadow: Environmental Issues and Options. Livestock, Environment and Development“, FAO, Rome, p. 4.